WHAT NEXT FOR HIE's CAIRNGORM ESTATE c/w FUNICULAR? As detailed in our last issue, the Cairngorms Campaign wrote to the Scottish Executive to make the case for the transfer of ownership of the Highlands and Islands Enterprise Cairngorm Estate, to be taken in for a ministerial review. Whilst NEMT joined other NGOs supporting this, it fell upon deaf ears as we were told that the Scottish ministers could not intervene. What has now happened is that Cairngorm Mountain Ltd, SNH and CNPA have all "rejected or discounted ownership (of the estate) in favour of a transfer to Forestry Commission Scotland." Given the political backdrop it is ironic that I find myself as never having been more challenged with my own time management than on reporting back on this particular (e)state of affairs. I am talking about a very demanding day job! 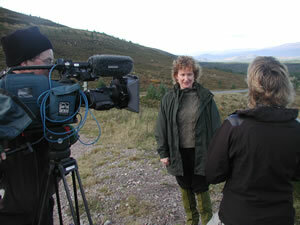 The point is that most, if not all, of the NGO's robustly supported the setting up the Cairngorms National Park. Given their brief, is it surely a manifestation of how we are "going down the wrong driel" if now we find we have a Park Authority that does not want to grasp this golden opportunity to fulfil their terms and so embrace the opportunity to take on ownership of the estate. NEMT was told that Park Board Members were chosen, not for their skill and knowledge base, but for their ability to get on with one another and address the task set out for them. We were told that if "experts" were required they would be called in to advise as deemed appropriate. When you look at the breadth of knowledge of the applicants who were rejected, and set it against those who have now selected NOT to take on this not un-daunting challenge, then you can see why we fall well short of what could have been a far more promising prospect for the estate. That the NGO movement in Scotland has never having been so diverse and energised provides another manifestation of this situation. Whilst not an efficient system for Scotland, ie many can see what is going wrong and have to try and put things right from the outside, this knowledge base has to find an outlet somehow! Thanks to the superb Landward series I was given the opportunity to bring a snippet of this to the attention of the viewers. Given the less than satisfactory situation described above, ownership by the Forestry Commission does have its merits. It is of real concern that the Consultation does not incorporate the opportunity to run the Glenmore corridor, already under Forestry Commission ownership, as a single unit together with the acquired Cairngorm estate. The proposal that the sole full-time Management Executive should be made up of the Forestry Commission Scotland (the owner) and Cairngorm Mountain Ltd (tenant and manager of the funicular) is not acceptable on the basis of a basic conflict of interest. This is further emphasised by the fact that SNH and CNPA are down-graded to the status of "invitation for specific items". The proposed system is devoid of the never more essential checks and balances. The breakdown of the Advisory Committee is acceptable, however the role needs to be better defined at the outset to ensure it is nothing more than an ineffective talking shop. The diversity of the recreational activities is also inadequately represented in the Forestry Commission Proposal. The Cairngorms Recreational Forum, one of the many pre-cursor bodies to the Park being set up, as ably chaired by Alan Blackshaw, and where myself and few others represented Mountaineering interests, represented a far better profile of the recreational interests in the Cairngorms. This could be a useful source of information for the Commission. Meanwhile NEMT remains on the case and, as ever, welcomes all hill-walkers to come along and play an active part of what is going on here, and now!